Most people throw away torn gift wrap as soon as they open their Christmas presents, but not Olivia Mears. 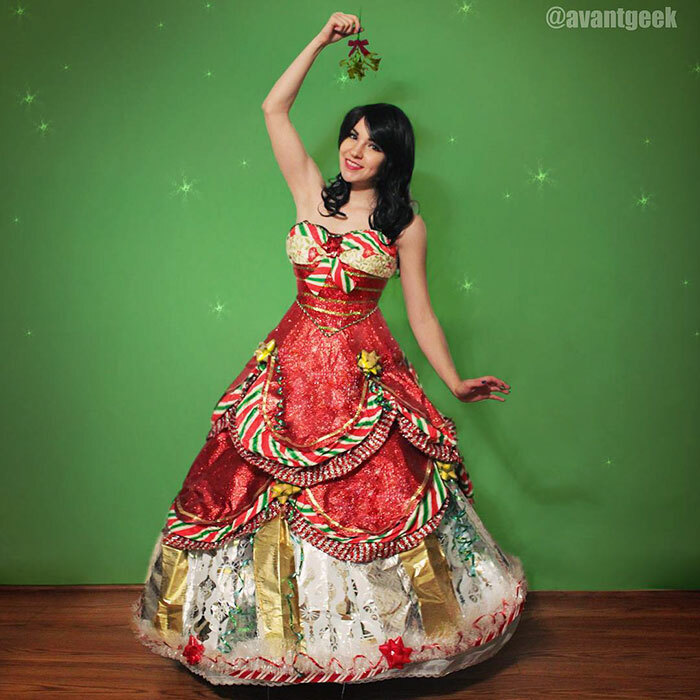 The 26-year-old costume designer from North Carolina uses the colorful junk to create Disney princess-like dresses. Mears is famous for turning unconventional materials into stunning outfits. Back in 2015, she went viral online for a “Taco Belle” dress inspired by Belle’s yellow gown from Beauty and the Beast, but with a dress featuring giant tacos. Keeping the Taco Bell theme going, she later created a dress exclusively out of Taco Bell wrappers, then a “Pizarella” dress shaped like a giant pizza, a warrior princess armour made of Pabst Blue Ribbon beer packaging, and even a toilet paper dress. But her torn gift wrap gowns are probably the most impressive.